The Brexit vote has left UK firms more exposed to currency fluctuations in an increasingly volatile and globalised market. Sterling’s devaluation against both the dollar and the Euro have improved competitiveness between firms inside the UK who are net exporters of products. This, however, causes major difficulties for businesses that are using sterling to buy imported products. They are exposed to currency movement and in some cases have seen 10-20% price increases on imports which have had a substantial effects on margins. Fluctuating exchange rates also make budgeting difficult creating uncertainty in cash and profit forecasting. potential negative impacts in corporate social responsibility terms if a firm is seen to ‘go where the cheapest goods/services’ can be found. Another option is to pass the currency risk to customers or suppliers by demanding payments in domestic currency. Although this approach will be tempered by the level of buying and selling power you have in the market. This is a simple and common strategy for SMEs particularly those that buy and sell in the same currency. The approach ensures you don’t need to change your revenue to sterling, which is usually the point in the process where most losses are incurred. Whilst this can be relatively easy in certain domains, one of the effects of uncertain economic outlooks is that banking regulations tend to tighten rapidly in response to concerns about currency. This can mean using a specialist adviser to ensure your bank account will meet your needs and not leave you facing unexpected charges or administrative delays that outweigh its value as a currency management tool. This management approach is traditionally used for crops, metals, and fuel. Although it is becoming more prevalent for other commodities. It requires an organisation to have a major commodity requirement, part of which they secure as futures which they will then aim to use when the market price is higher. This approach can be utilised with currency to try and avoid exposure to adverse currency fluctuation, although this can be hard to predict in volatile circumstances. It is vital that a business attempting ‘buying forward’, partners with those who have substantial market experience and a strong track record. 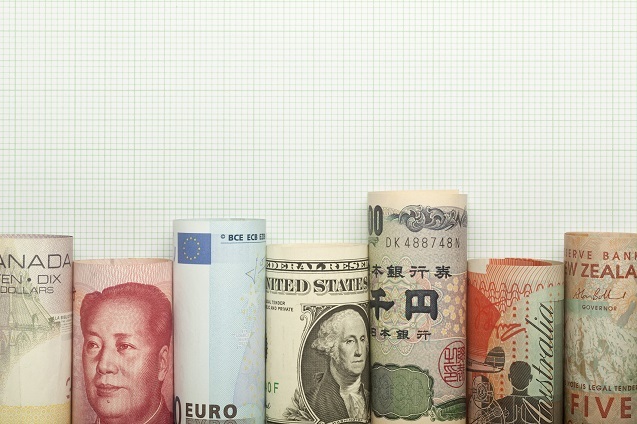 It is essential to know the actual effect of currency fluctuations on your supply chain. For example, while a business may source end products from America which is costly in the current circumstances, it may turn out that raw materials or components are being bought in to the USA from South America, China or Eastern Europe. This information can give the end of chain business scope to renegotiate costs and protect profit margins.